Buying land, getting planning permission for it and then selling it to house builders for a profit. Developing commercial property such as warehouses, offices and industrial units. It also has a small house building business. Rental income from a property development portfolio. Construction contracts, plant hire and a stake in the A69 road link road PFI maintenance contract from Newcastle to Carlisle. This 30 year contract has just over 8 years to run. 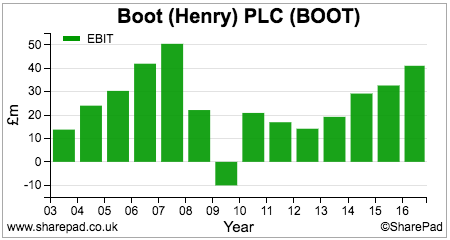 A quick glance at the company’s share price chart and financial history shows that it is a cyclical business where profits have a tendency to move up and down with the fortunes of the economy. The trading loss in 2008/09 is a good example of this. Henry Boot suffered badly in the 2008/09 recession with significant write-downs in the value of its land holdings and property investment portfolio. A weak construction market compounded these problems and forced the company to slash its dividend. Like many property companies, it has recovered well due to an environment of low interest rates and a booming housing market. 2016 was a very good year for the company with a strong property development business feeding through to strong growth in sales and profits. 2017 has been even better with profit forecasts being increased twice as the company has sold land and developments faster than it thought it would. Perhaps the most interesting business from an asset value point of view is the land promotion business which trades under the name of Hallam Land. This business typically buys agricultural land, secures planning permission for it and then sells it to house builders sometimes doing some infrastructure work to allow the builders to move in. Land is treated as an inventory in that it is valued on the balance sheet at the lower of cost or net realisable value. When housing markets are healthy the balance sheet value of land tends to understate its true value. In bad times it can overstate it and often has to be written down to a lower net realisable value. 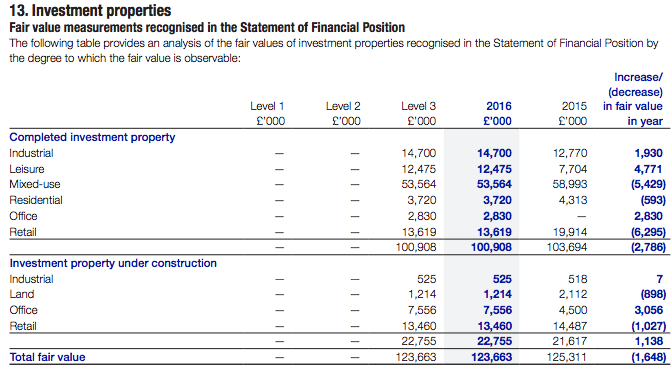 The land bank is currently sitting on the balance sheet for a cost value of £106.5m. This comprises 80 sites, 12,131 acres and 27,693 housing plots. The company either owns this land, has a small stake in it at the moment or has an option to buy it. 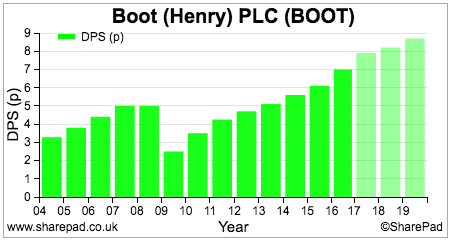 Boot has been making consistently healthy profits from its land bank in recent years. It sold 1609 plots in 2016 at a gross profit per plot of £14,700 giving gross profits of £23.7m. In the first half of 2017, it sold 960 plots at a lower gross profit of £11,600 per plot. Trading in the second half of 2017 has been brisk. With its trading update on 20th October, the company said it had sold 2048 units so far in 2017 and had already exchanged contracts on four sites for sales to be booked in 2018. My view is that there are significant future profits hidden in this land bank given the current level of house prices. Land with planning permission is clearly worth more than land without it. 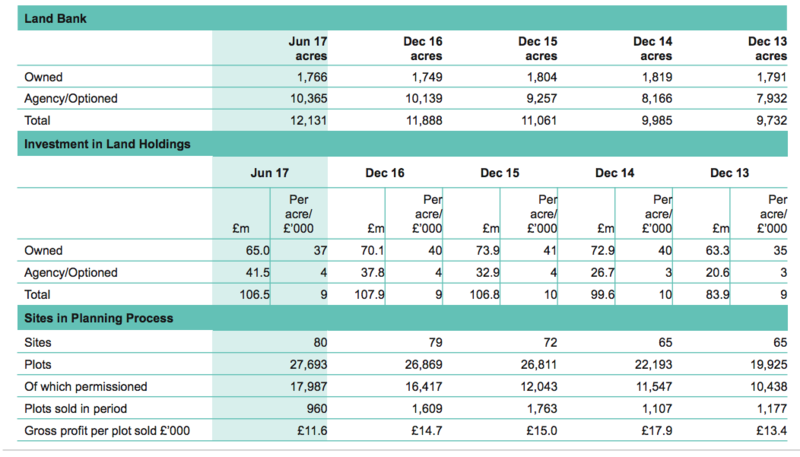 If we just take the permissioned plots of 17,987 and casually assume that they could all be sold today at a gross profit of £11.6k then that would realise gross profits of £209m. This is a very rough and ready estimate as the costs and gross profits will be different across the 80 sites. Clearly other costs would have to be deducted, but my feeling is that my admittedly crude calculation leads me to believe that Boot’s land bank is worth more than its current balance sheet valuation of £106.5m, especially as no value has been given to the land without planning permission. How much more? I’ve no idea. One of the most important lessons I’ve learned in studying land and property prices is that land prices are much more volatile than house prices. This is because the value of the land is determined by the expected selling prices of the houses to be built on it. Builders have hurdle rates – the rate of return they want to get from their building sites – and work backwards from the selling price to get a value for the land. Let’s say the expected selling price of a house is £200,000 and the builder wants to make a 25% gross margin (£50k). If the build cost is £100,000 then the most they would pay for the land is £50,000 – selling price less build cost less target profit margin. If selling prices fall or hurdle rates rise, the price builders are prepared to pay for land falls. This then reduces the value of land for companies such as Boot. Boot’s land value is therefore very geared to changes in house prices. My educated guess based on studying house builders is that for every 1% change in selling prices, land prices change by around 2.5%. The bad news for Boot’s shareholders is that hurdle rates are increasing as builders have become more cautious as house price inflation moderates. Some builders are also holding quite short land banks and don’t seem to want to buy lots of land at the moment. They are also look to take 2-3 years to pay for land which means companies such as Boot might have to wait for their cash. Looking at Boot’s half year balance sheet, there was a significant increase in trade receivables which may suggest that this is happening. 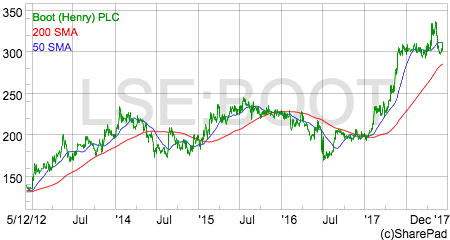 This and the purchase of stocks of land and equipment for its plant hire business explains why Boot rarely converts its operating profits into operating cash flow. In fact, cash only tends to exceed profits during times of depressed trading conditions – when the company cuts back on buying land and land sales fall which tends to lead to a fall in trade debtors. With most other businesses, the failure to turn profits into cash flows would often be seen as a red flag and a cause for concern. For a business such as Henry Boot this is not the case. It is purely down to the characteristics of its business. This may not make it as attractive as more cash-generative businesses but it is not a sign of dodgy accounting. House prices are not falling at the moment and new build property is supported by the Help to Buy scheme up to a value of £600,000. That said, house prices are very expensive relative to earnings and rents and are vulnerable in my view even with subsidised mortgages on new builds. There is also a push by government to build more affordable housing which may reduce the value of land. 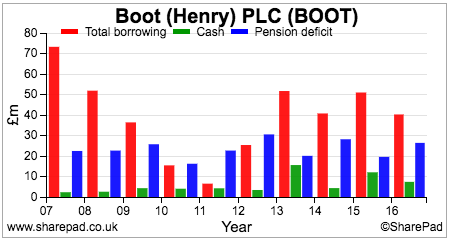 That said, I think the value of land on Boot’s balance sheet is quite conservative. Let’s move on to Boot’s property development business. At the end of June 2017, the company had an investment property portfolio valued at just over £131.9m on its balance sheet which has been producing a steady rental income of £8.2m per year. The makeup of the development portfolio can be seen below in a snapshot from the 2016 annual report. The properties have to be valued at market values every year by a team of professional property experts. Values are still on the up in 2017 and have increased by £8m between December 2016 and June 2017. On the development side, the outlook seems to be encouraging. There is over £700m of gross development value to be delivered over the next few years which includes over 2 million square feet of industrial and logistics properties. 90% of this is pre-let or prefunded. The company is also looking at further project with development values of over £500m. Profits from this source look to be reasonably secure for the next year or two. The same can probably be said for the construction business. It entered 2017 with a workload equivalent to 90% of its budgeted revenue. 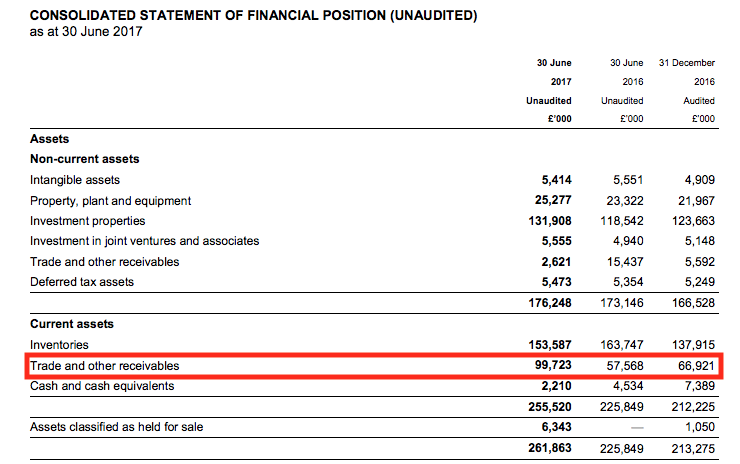 The profits from the A69 PFI contract are very stable (Boot’s share is about £2.9m) and have another nine years to run. The Banner plant hire business has more contracts than a year ago whilst there is a decent level of civil engineering contract work. Competition in construction is currently very fierce. The low margin and cyclical nature of construction means that investors should not value this business too highly in my view. So overall, Henry Boot looks to be in good shape. It is not carrying too much debt but does have a pension fund deficit which needs an eye keeping on. In terms of future profits, City analysts aren’t expecting much in the way of profits growth over the next few years after a bumper 2017. That said, I think profit upgrades are possible if the demand for building land remains robust. Given that Henry Boot is essentially a land and property company it makes sense to value it on the basis of its assets rather than its profits. The current net asset value per share as of 30th June 2017 was 184p. This compares with a current share price at the time of writing of 300p. 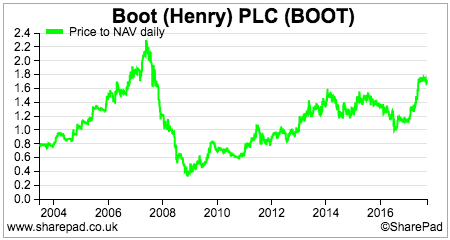 At first glance this makes the share price look to be quite well up with events. 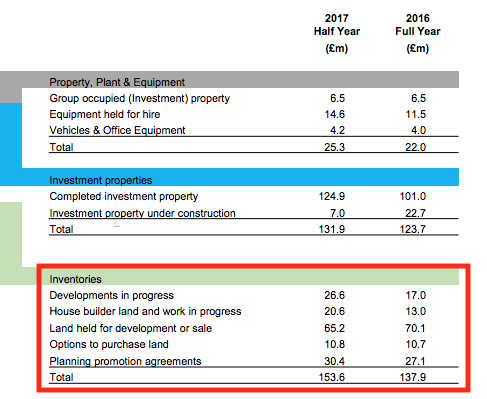 That said, the value of building land is only on the balance sheet at cost and not at a value it might realistically be sold for. I don’t think it is too unreasonable to suggest that the market value of land is probably much greater than £107m. 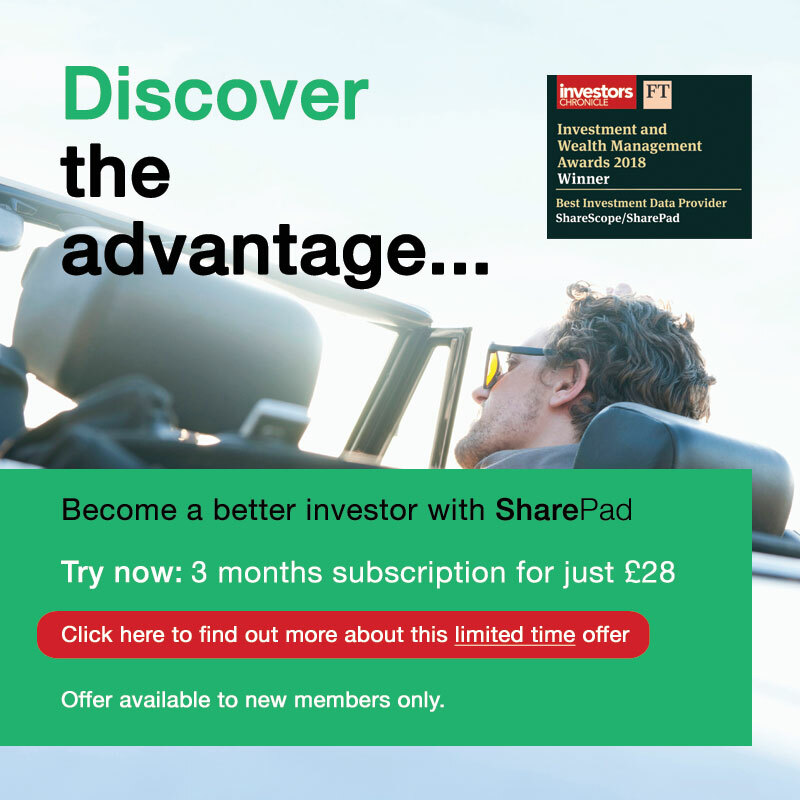 If it was worth double that amount then that would add another 81p to NAV per share to give an estimate of 265p. Estimating the value of this land is not easy. It depends on so many different variables such as future house prices, location, planning consents and the timing and size of future land sales. All of these are unknown. 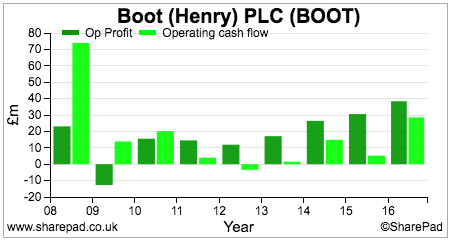 What seems to be the case is that a decent uplift in land value has been priced into the shares at the moment. Henry Boot is a well-managed business in my opinion. Its shares have had a terrific run and have increased in price by over 50% since the start of the year. 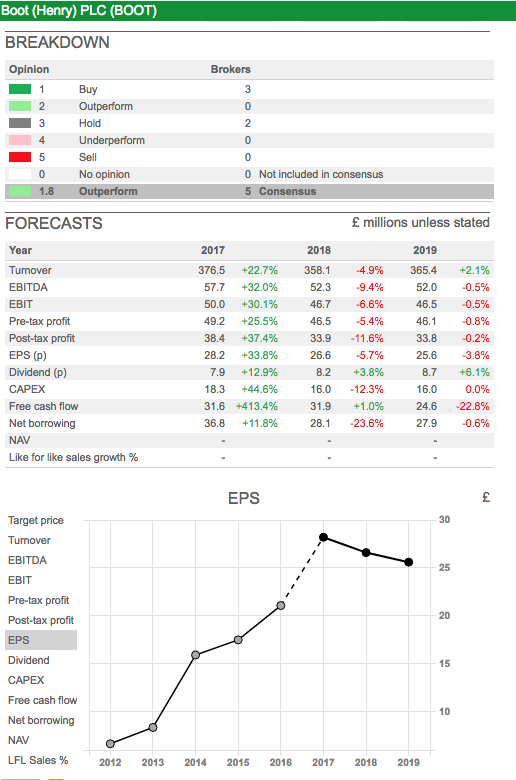 More material upgrades to profit forecasts are probably needed for these shares to move much higher. The company will release its 2017 year end trading statement on 17th January 2018.